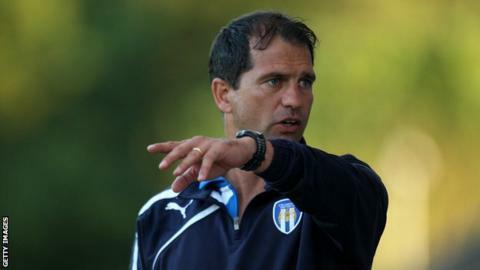 Colchester manager Joe Dunne has left the League One club by mutual consent, with academy boss Tony Humes appointed as his successor. Dunne, 41, has spent the last two years in charge of the U's but they currently sit 23rd in the table, with only one point from five games. Assistant Mark Kinsella, who was brought in by Dunne, has also left. Former Ipswich and Wrexham defender Humes, 48, arrived at Colchester as head of youth in 2009. Humes will be assisted by former Ipswich, West Ham and Southampton central defender Richard Hall, who had previously been working with the club's under-21 side. "Joe is a Colchester United legend and I am grateful for the way he kept our club in League One during these challenging times," said chairman Robbie Cowling after Dunne's departure. "I wish him all of the very best for the future." "Whoever was manager at Colchester United would have found it almost like defying gravity, having to deal with large cuts to the playing budget in a highly competitive League One. The chairman, I guess, has now come to the conclusion that despite these cuts, it is possible to be successful, but not under Joe Dunne. Joe has given so much to Colchester United over the years - the colours of blue and white coarse through his veins - and to let him go in this way is difficult. " Dunne previously made almost 200 appearances for the club in two spells during his playing career, and took charge in September 2012. Colchester only won six of his first 21 matches in charge and after considering his position in January 2013, he stayed on to guide them to a 16th-place finish last season. On Saturday, however, United suffered their fourth consecutive loss of the new campaign as they were beaten 3-1 by leaders Peterborough. The former defender was in charge of the club for 95 matches in total, winning 27, with 48 defeats.